We love bird hunting in Michigan, and we are here to give you tips on catching one of the best game birds of Michigan: the wild turkey. We are one of the best Michigan pheasant farms, but, we also offer a variety of bird species for your hunting pleasure (including turkeys). Michigan bird hunting relies heavily on the perfect weather, but it also relies on the perfect game for our hunters. 1. Get there early and discover where they are roosting. Before the season even starts, go out and take a stroll around the woods to find the favorite areas in which the turkeys are gathering. This will also show you where the hens are, and following them will definitely lead you to their toms. It’ll give you a solid start when bird hunting season starts. Remember not to actually do anything or you could spook them into moving their nesting ground somewhere else. 2. Do not over call. 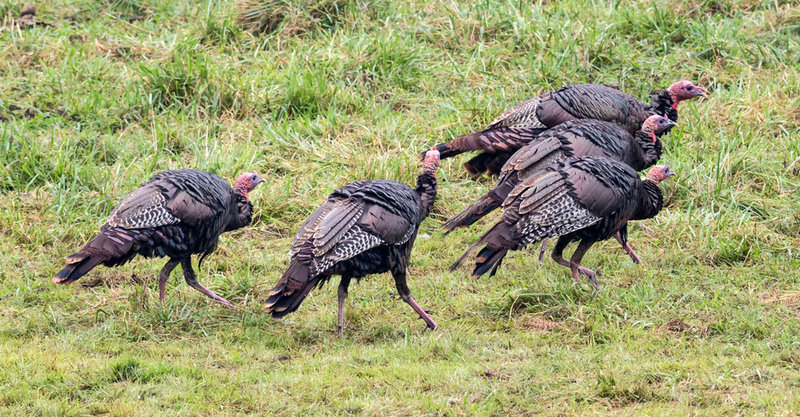 Male turkeys gobble to attract a female hen to mate. The reason the call works is the other male is trying to out gobble you and win the hen over. By constantly gobbling, you are, in fact, letting the turkey know you are not doing very well in trying to get the hen. By holding back the call, the turkey may start getting mad and running without looking, trying to find the hen that is playing coy. Make the tom jealous, don’t have a conversation. 3. Invest in more than one call. This may seem silly but think of it like fishing. You aren’t going to show up to the lake with one gummy worm for the whole day. Buy a turkey vest and use all those pockets to bring different callers on your hunting trip. You never know when you’ll need an angry hen call or a mating tom call. It won’t hurt to invest. 4. Shoot your gun before you get to the field. Don’t just trust it’s going to do as well as it did the year before. Test on clay birds or even soda cans to make sure your aim is accurate. Also, use different sorts of ammunition so you can adjust early at how your gun is going to react with the different ammo. 5. Don’t ignore the afternoon! Some of the best times to hunt is either early in the morning and later in the evening. About midseason, many hens will be sitting on their eggs from the toms and the toms will be looking for other hens that are receptive to their advances. You could get a great shot on toms that are getting antsy. So, take advantage and go when other hunters aren’t going! 6. Using the right decoys can be tricky. Figuring out how many and where to put them can be challenging at first, but here’s a tip on how to set up your decoys. If there is more space, such as a meadow or clearing, use more decoys because they can be seen from farther away. The toms won’t be able to tell that a decoy is a decoy from a distance, so use that to your advantage. In thicker cover or in the underbrush, use them sparingly so a tom can be cruising by and be startled by a decoy hidden behind a bush. These are just a few tips to help your bird hunting in Michigan this year. Fall is just around the corner and the turkeys are going to be ready for hunting soon. So, make sure you stock up on callers and decoys, and we will see you out in the field!